Idea 1: Imagine if you will a podcast widget. This little box looks like a tape recorder. It has a play, record, rewind, ff, and pause button, all large and friendly. It has a small (gasp) speaker. When you want to record, you treat it just like an old fashioned tape recorder. But there’s a twist. It has a USB plug. When you plug it into the computer, it asks you for a title and a date. You enter it, and the recording becomes a podcast on the web automatically and a copy is saved on the computer. Once the podcast upload is done, the device clears itself and is ready for the next recording. The podcast MP3 file is then available on iTunes via a normal Podcast feed…. automatically! A device like this would make podcasting as easy as tape recording … churches, schools, and workplaces would be able to keep current versions of lectures and presentations on the web with the same work it would take to put it on cassette. It should be durable and easy to hold..a familiar form that doesn’t intimidate. It should have a built-in stereo mic (like the awesome ones found on good camcorders.) Long periods of silence would be automatically removed, and the volume level of the recording would be automatically maintained. Software inside does this transparently. It should be cheap and so simple that there are no special skills required. The technology should be good enough to hide all the neuances of recording and publishing. 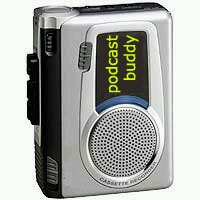 Let’s call it the podcast buddy. Idea 2: The Podcast phone – or … podcasting from your cell phone. Imagine a phone number that you call to podcast. A teacher could call this number to record the homework notes for the day, for example. Conference calls could be recorded and automatically podcasted to private audience at a company. Personal podcasts could be done from a cell phone… like blogging from the car.